When The Amazing Spiderman 2 released it’s latest trailer, it looked like it could become a little overstuffed with material and overcrowded with villains. It appeared to be trying to run through too much story to set up its sequels without giving this story too much care – and that’s how things pretty much unfolded. When it comes to entertainment, Spidey 2 gets it slightly right. The effects are top notch and the action sequences are effective and provide some solid spectacle. The problem lies in the lacklustre villains here that are underdeveloped and underused. They could’ve been handled better – instead, their development and their payoff feels rushed and ultimately underwhelming. Jamie Foxx puts his best into what he has to work with but the tragedy of the Max Dillon/ Electro character could’ve been better developed. Instead, him – and a musical number that accompanies his earlier scenes – feel like I’ve wandered into some comic thriller. It’s off putting. The same goes for the character of Harry Osbourne. Interesting bloke right? Has an intriguing dilemma, right? Well, that’s a breezy little arc you’ve got there. Wonderfully played by Dane DeHaan but underdeveloped and underwhelming. Let’s hope that’s saved for a sequel. This is a main issue with the film. It seems so busy and caught up setting up sequels and the franchise that it doesn’t appear to be showing any care for this instalment. I don’t like that, it’s messy and unfocused and underwhelming. A highlight here is the relationship between Peter Parker and Gwen Stacey. They get the big ol’ messy heart and their scenes work quite well, thanks to the chemistry of the two leads and providing much warmth and humour to the story. 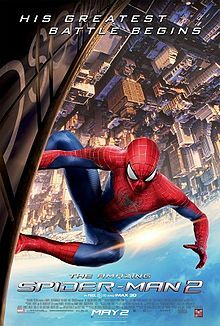 The Amazing Spider-Man 2 is entertaining with its spectacle but I would’ve preferred more depth and weight with what I was seeing. It’s certainly impressive with effects and action but this is a story that could’ve been more developed and less busy.